PAR-KUT International has manufactured portable steel buildings since 1954. Using 100% welded steel, we make stronger and more durable portable steel buildings than the competition! We are strategically located in Harrison Township, Michigan, near I-94. Our portable steel building features include from galvanized steel construction and NEC compliant electrical systems to tempered glass windows and a factory installed main breaker in the electrical panel. No one know portable steel buildings better than PAR-KUT International. Par-Kut portable steel buildings are all prefabricated and factory assembled portable steel buildings and ready to be installed. 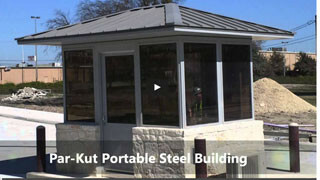 Watch our portable steel building video to learning more about Par-Kut portable steel buildings! For almost 60 years, Par-Kut International has provided the safest, most attractive and durable portable steel buildings to virtually every industry known. Par-Kut portable steel buildings can be found in commercial, industrial and governmental settings throughout the United States and in countries around the world. 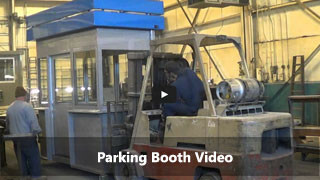 Initially, Par-Kut booths primarily served the parking industry, but today their presence is known in many special purpose applications and most extensively in the security industry – both private and governmental. Our portable steel buildings include guard booths, guard houses, guard shacks, security booths, parking booths, information booths, ticket booths, toll booths, steel shelters, smoking shelters, prefabricated shelters, in plant offices and more. 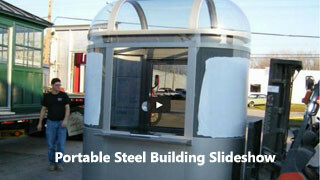 Watch our portable steel building slideshow video to learn more about our history.